My maid Anjana Patra has been working at my place for the last 3 years. She is a hardworking and trustworthy woman who hails from West Bengal. She moved to Bangalore couple of years ago in search of a work after her 1st husband got electrocuted to death. She was struggling to make a living on her own and managed to sail through for the last 5 years after her husbands death. She has been working as a cook+ maid and earns about Rs. 15000 every month. I persuaded her to re-marry as she frequently complained of being harassed by men living around her house considering she had no one to fall back on. 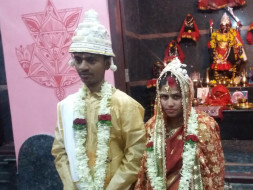 It was only 2 months ago that she decided to re-marry (a man named Atanu Pandit who also works as a cook in Bangalore) hoping for her life to get better. 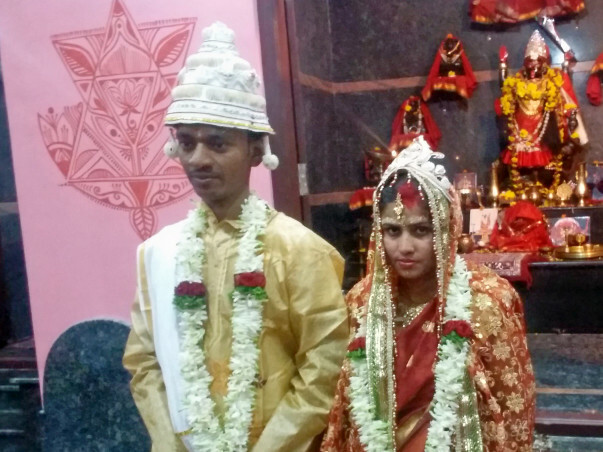 Just when she and her husband were settling down in their new lives- her husband Atanu Pandit has been diagnosed with a malignant tumour. They have been consulting Dr. Ravindra Mehta at Apollo Hospital, Bannerghatta Road Bangalore. My maid does not have financial aide from anyone other than me and her husbands parents are poor farmers who make their living from the farming they do on their little patch of land back in the village. After undergoing several tests, the doctor suggested that a surgery had to be done on an immediate basis. The cost for the same is estimated to be Rs. 4,00,000. The post surgery medication and scans might add on to another Rs. 1,00,000. 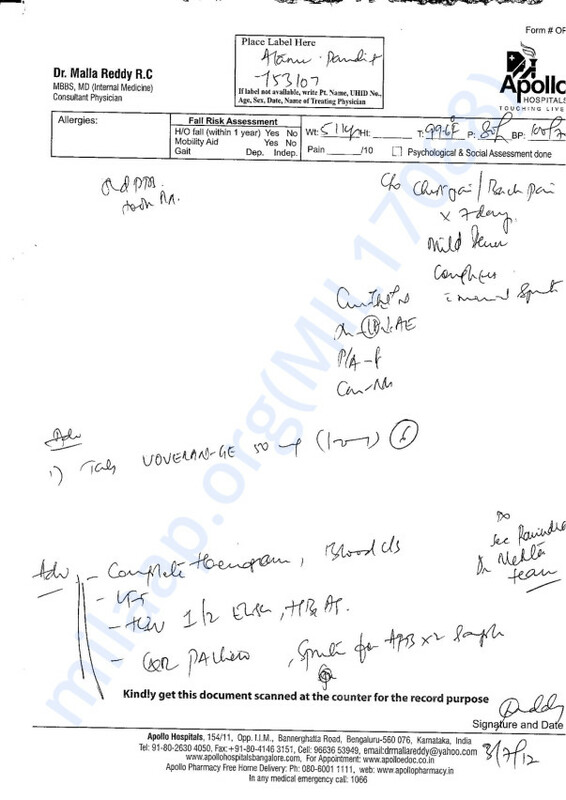 I am attaching the bills of the various scans done along with few scan reports to authenticate my claim. I am trying to raise Rs. 5,00,000 for Atanu Pandit to be able to get operated. Your donation will help save a life. The operation has been done. He has also been discharged from the hospital. Its been about 4-5 days since he is back home and is on bed rest. Thank you for all the love and support all of you have shown. I am happy to inform you all that Atanu underwent the surgery yesterday at Narayan Hrudayalaya hospital, Bangalore. The tumour has been removed so has 1 of his lung. He has been shifted to the ICU after the surgery and he will be under observation for the next 2-3 days till doctors think it is OK for him to be shifted to the general ward. Atanu will be at the hospital for the next 2 weeks till he heals and is considered fit to be discharged. Anjana has asked me to convey her deepest thanks to all of you out there without whom she would have possibly lost her husband. I hope things fall in place for Atanu and Anjana very soon. We might still need some donations for the post surgery scans and medications. Please pass on this message to your friends and family who might be able to help raise the last round of donations. First of all, I would like to thank you all for your generous support. Last 2 weeks, Anjana has been running around to get all the additional scans the doctors have suggested. In this process she has blown up close to Rs. 45,000 inspite of she making it clear to doctors that she works as a domestic help and earns nothing more than Rs. 15000 each month. She is now contemplating between Vydehi Hospital and Narayan Hrudayalaya. Both hospitals have told her that they will probably need to remove 1 lung for Atanu as it has been severely infected. 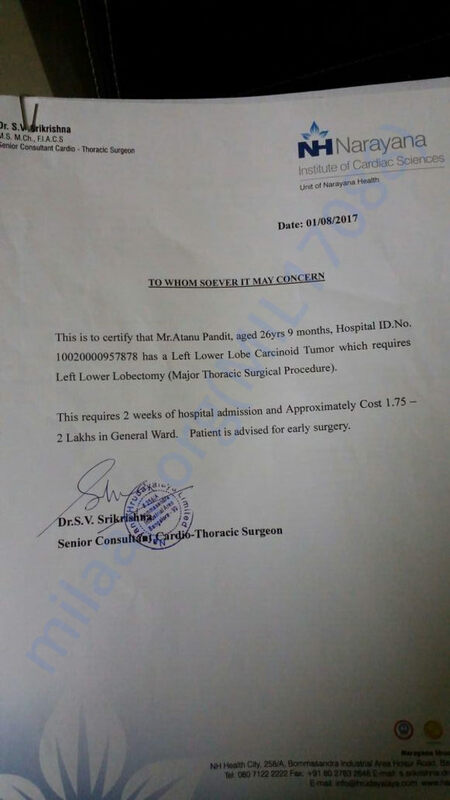 Atanu's BPL card is apparantly not going to be of any use as it is issued in West Bengal and the doctors and hospital staff have refused to accept that. Not sure if thats how it work. 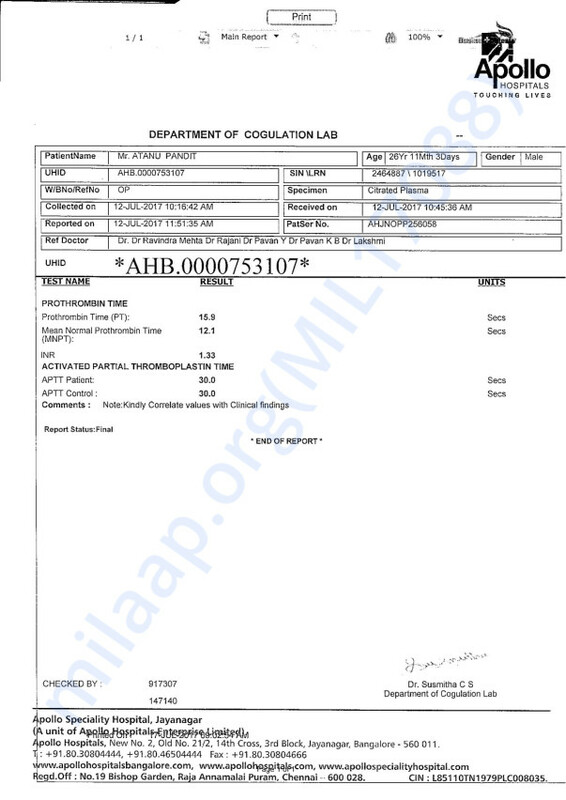 Vydehi has given her an estimate of 2L which i think will extend upto 3L considering the way these hospitals make you end up paying for things. We have been able to raise 1.5L on Milaap so far, It will be great if you could check with your friends and family to see if you could extend help financially. I will sit with her this weekend to decide on which hospital to go ahead with. The surgery will be happening in the next 1 week to 10 days time. Thank you all once again. All this would not have been possible without your help.